“We’ve had minimal violence today and that’s always our goal,” she said. “We said our side and they said theirs. They openly say they support communism.” At one point, she had an extended, measured debate with an anti-fascist protester, facilitated by the “Empathy Tent,” wherein they argued for and against Medicare and whether the LGBTQ community was more protected by or put in danger by communism. Owen Shroyer - short discussion with Edwin. Rules Imposed, weapons banned for Select City Parks, Streets on Aug. 5. The Empathy Tent team will host online and in person empathy circles between the different communities that want to be heard and want to take part in constructive dialogs. These will happen now up until the Aug 5 rally. During the event we plan to hold empathy circles in and around the Empathy Tent. We will hold empathy circles after the event. Listening to David Carson, Right Wing supporter before Berkeley Aug 5, Anti Communist Rally. Empathy Tent offers listening and Empathy Circle facilitation to all sides. We invite you from the: left, right, center, or anywhere to take part. You talk and we will listen. Amber is the organizer of this event. 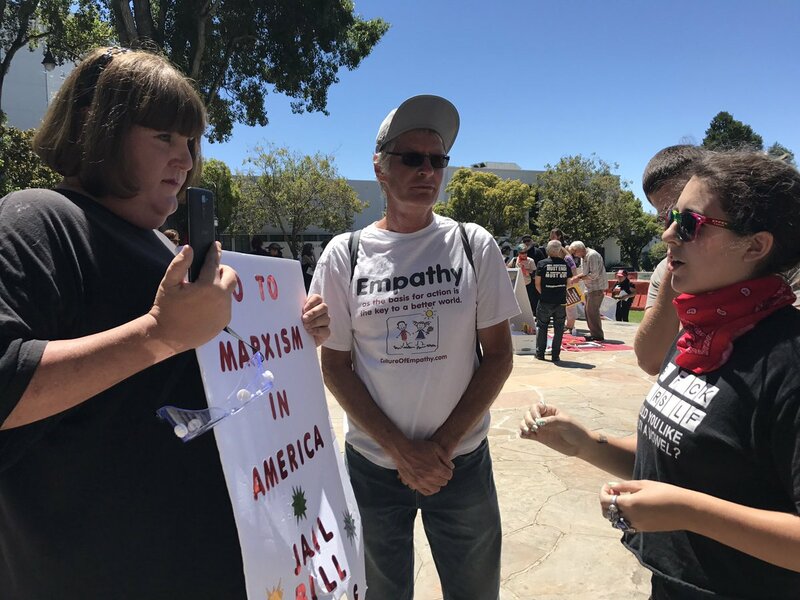 "Amber Cummings, the self-designated (but no-show at least in this female persona) organizer of the August 27 right-wing non-rally at Berkeley's MLK Park, engages in dialogue with (presumably) a protester against Ben Shapiro's appearance on the UC Berkeley campus. The Empathy tent,a fixture at recent contentious demonstrations, is maintained by volunteers who offer to listen to everyone." A basic Empathy Circle dialogue with organizers of these San Francisco left and right wing political and counter rallies. Conservative "Based Stickman" enters "The Empathy Tent." "My left-leaning friends may banish me to the far reaches of the earth for this... That said-- I think there is something to be learned from sitting down with people you disagree with and speaking to them in a civil manner. Obviously, in recent months, tensions at UC Berkeley have lead to anger, hostility, violence and riots. This passed week, former Breitbart editor, Milo Yiannopoulis scheduled a “Free Speech Week,” evidently intent on inflaming tensions once again. In response, David Gottfried & Edwin Rutsch have been putting up an "Empathy Tent.” Their hope for the tent is that it would be a place for dialogue between left and right leaning activists"